What Was It Like Bringing Home a Child Born with Down Syndrome? You may think that bringing home a baby with Down syndrome is going to be drastically different than a typical baby. I was highly surprised that it wasn’t. Noah needed to eat, be changed and cuddled just like every other baby I knew. He was actually an amazing sleeper. We struggled a bit with feeding at the beginning but he soon figured that out as well. Noah was our first child so we had no idea what we were doing in general, now that I’ve brought home two other children I see how similar the journeys were. Even the tears, I’m pretty sure I’ve cried equally for all of my children. Development is different. The most important things to remember is that every child has their own timeline and their own strengths and weaknesses. Noah’s strong point has always been gross motor skills. He was an early walker when it comes to Down syndrome and was constantly on the go. I have heard that some kids are movers and some are observers, Noah was definitely a mover. Development was pretty matched with his peers the first few months but slowly the gap has widened over time. We first noticed the delay in walking and now we see it most with speech. You will have to fight the urge to compare to others, even comparing to those with DS. One thing I have realized is that it doesn’t bother Noah that he has had to work harder to achieve tasks, or that he can’t do certain tasks that his friends can do right now. It also doesn’t bother his friends. They love him for being Noah, not for what he can do. One of the wisest things that I have heard about raising a child with Down Syndrome is to not expect them to be a fish who can climb trees, in other words, don’t try to turn them into something they weren’t created to be, accept them just as they are. Don’t get me wrong we still work hard. We have done every therapy you can imagine. But Noah will never be judged by what he can and cannot do. Our family is adventurous. We love to travel, go to amusement and water parks and find fun events to attend together. Noah absolutely loves a thrill. He rides more roller coasters than I do. We have travelled to New York, California, Colorado, Florida and Mexico together. He would pack a bag and get on a plane any day of the week if we let him, in fact we frequently find him by the door with a packed bag full of clothes, toys and books. Noah’s favorite activities are probably swimming and going to the movies. If your child has siblings how are their relationship with each other? Noah now has two little brothers. His middle brother is 4 and they are the bests of buds. They are usually inseparable and don’t want to do things without the other. Jaxten, our middle child, in my opinion, is more compassionate and socially aware than your average 4-year-old. He has learned to help others and to include everyone. One of my favorite things to watch with him is how he is friends with Noah’s buddies who also have an extra chromosome as well. His youngest brother is not yet 1, but Noah can get him to smile better than the rest of us. I know they too will have an amazing bond and we will enjoy watching their friendships flourish. We have been extremely blessed with Noah’s health. We see several specialists but it is for routine care. Our biggest challenges have probably been with speech and school. As I mentioned every child has their strengths and weaknesses, speech is one of Noah’s weaker areas. We, however, see growth every day and we understand him more and more. He uses sign language as well as makes up his own signs to explain what he wants. He has taught me that communication is so much more than words that come out of someone’s mouth. School has been a challenge as well. While there are laws in place for the inclusion of those with disabilities, it is not practiced widely. We had to fight to keep Noah in our neighborhood school and be included in the classroom. I get why they wanted to send him where they did, but one of our main goals for Noah is to be included and valued in the community in which we live. It has been amazing to see the benefit on both sides for Noah being present in our school. After the initial discussion of placement, our school has drastically changed that way that it does special education. They are bringing in new programs and hiring new people. They see the value of having children like Noah there and we so appreciate them making the effort to best teach him. I have been blown away by the friendships that Noah has. He has friends both with and without Down syndrome. The way his peers have accepted him without questions brings me so much hope for his future. What Would you Tell Yourself Now That You Know What This Journey Is Like? I wish I could go back to when Noah was born and wipe away all the tears and tell myself just how amazing this is going to be. Noah changed the way that I view the world. I see all people in a different way than I did prior to his birth. I’d tell myself to take a deep breath and realize that I can’t therapy Down syndrome out of Noah, but that he will continue to achieve goals on his own timeline. I would tell myself that you would change the world for your son but you wouldn’t change one thing about him. 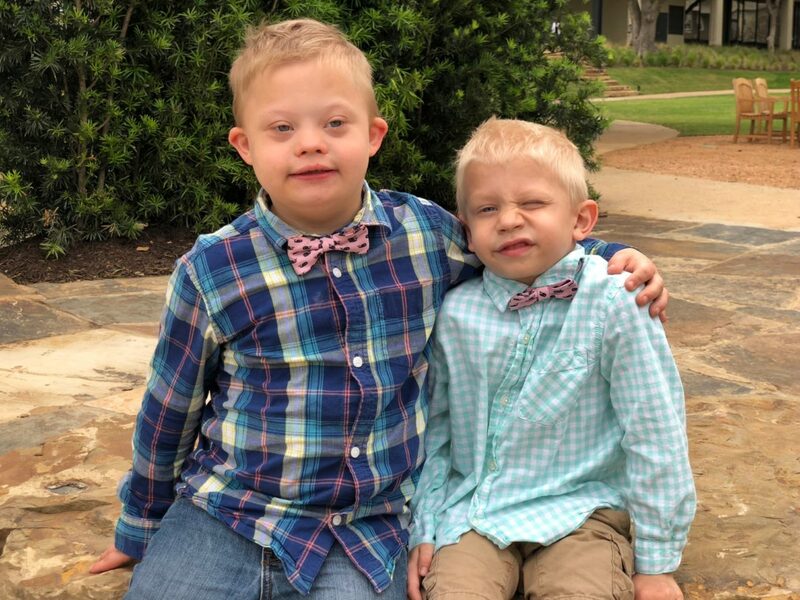 I would shower them with congratulations because their baby should be celebrated no matter how many chromosomes are present. I would let them know that it is ok to go through all the emotions that they are feeling, and just because they are sad or worried doesn’t mean they don’t love their child. I would let them know they are about to go on the greatest adventure that is truly life changing in mostly good ways. Their child has worth and value not based on what they can do but by simply being who they are. And while I know that when this journey first starts out there are tears, they quickly pass and joy takes over. Are you interested in having your story shared on our blog and social media channels? Click here to submit your story! Beautiful story. Our daughter is now 40 and like you I see the world differently than before she was born. Everyone is different, no two people the same. Our daughter has taught me to accept people for who they are, not what they look like or what they can or cannot do. Well Noah, keep sharing your stories & I can’t wait to see you in action as a boardmember( maybe you should have videos of it. )keep up the good work in school & speech, etc. Noah’s story is a hope story for me. I recently had a baby with down syndrome and i have learned a lot by reading your stories on Noah’s Dad website and Facebook page. I have got lots of encouragement from Noah especially being in Uganda East Africa where resources on down syndrome are limited. All i can say is thank you for being such a blessing to me and my little boy.